If you buy a Haplotee or any other DNAGeeks merchandise through this blog via this LINK, I'll get some cash. Why is this important? Because 2018 is going to be a huge year for population genetics, and especially for ancient DNA, and if this blog is also going to be huge, then I'll need some money. 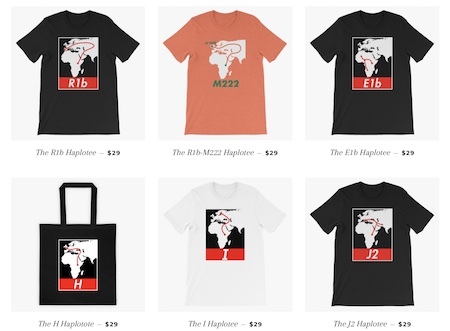 So if you like this blog, or even if you hate it, but you like spending time here hating it, then buy a Haplotee. Or several. Please note also that I've recently launched a genetic ancestry online store, which will be updated regularly with different tests throughout the year (see here). By purchasing tests from the store, you'll not only be helping to make this blog awesome, but also getting amongst the most accurate ancestry analyses available anywhere. Thank you for your support. David W. Anthony has just posted a new paper at his Academia.edu page titled Archaeology and Language: Why Archaeologists Care about the Indo-European Problem (see here). It's not only an interesting discussion about why the search for the Indo-European homeland is still such a big deal, but also a useful, almost up to date, summary of the fascinating stuff that ancient DNA has revealed about the genetic history of Europe, with a special focus on the origin of the Corded Ware people, who are generally accepted to be the first Indo-European-speaking population of Northern Europe. Now, I say it's an almost up to date summary, because Anthony seems fairly certain that the Corded Ware people were descendants of the Yamnaya people, rather than just their close relatives. He uses archaeological and ancient DNA data to argue that Yamnaya migrants moved from the North Pontic steppe to the eastern Carpathian Basin (present-day Hungary), and then onto what is now southern Poland to give rise to the proto-Corded Ware population. I probably would've said this was a highly plausible scenario before I saw the ancient DNA results from the latest preprint of Mathieson et al. 2017, an ancient genomics paper in the works focusing on Southeastern Europe (see here). But now that I've seen those results, I feel that Anthony's proposal might be outdated. One of the samples in that preprint is from a pre-Yamnaya Eneolithic burial on the northern edge of North Pontic steppe, in what is now eastern Ukraine, labeled Ukraine_Eneolithic I6561. This individual not only strongly resembles the Corded Ware people in terms of genome-wide genetic structure, but also belongs to Y-haplogroup R1a-M417, which is a paternal marker probably no older than the Eneolithic and intimately associated with the Corded Ware expansion. Currently, as far as I can see, he's by far the most likely candidate in the ancient DNA record to belong to a proto-Corded Ware population. Keep in mind also that not a single instance of R1a-M417 has yet been found among a wide range of prehistoric individuals from the Carpathian Basin. On the other hand, Olalde et al. 2017 (see here) did manage to catch one Early Bronze Age (EBA) Bell Beaker from the region belonging to R1b-Z2103, which is the paternal marker currently most strongly associated with Yamnaya. Below is a map of Central and Eastern Europe ca. 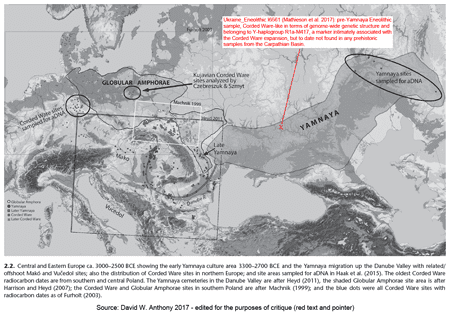 3000-2000 BCE from Anthony's paper, edited by me to show the burial location of Ukraine_Eneolithic I6561. If we assume that his descendants or close relatives were the proto-Corded Ware population, then looking at this map, it seems unlikely to me that they would've taken the Carpathian Basin route before expanding into Northern Europe. Rather, I'd say that they would've fanned out across the north directly from the steppe, perhaps along those northward-pointing river valleys? And I suspect that they may have still been a pre-Yamnaya group as they migrated out of the steppe, just as Yamnaya was forming somewhere to the east. But hey, Anthony might be right, and I might be way off. Indeed, perhaps Anthony based his theory, to an extent, on soon to be published Yamnaya samples from the Carpathian Basin? If such genomes have been sequenced, and at least one belongs to R1a-M417, then it's game over as far as the origin of the Corded Ware people is concerned, and I'll welcome the surprise. Here's a map from yesterday's presentation by Italian archaeologist Massimo Vidale at the MPI-SHH Jena Cross Roads conference on South Asia. 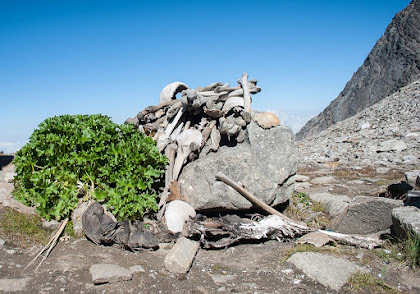 He was focusing on the skeletal remains from the protohistoric, and likely early Indo-Aryan, cemeteries at Udegram and Gogdara in the Swat Valley, modern-day Pakistan. Source: Twitter. And this is my own map from back in August (see here) summarizing what ancient DNA (both published and otherwise...nudge, nudge) is telling us about the early Indo-European, including Indo-Aryan, expansions across Eurasia. Remarkably similar, aren't they? And obviously I'm not just talking about the use of ellipses and red arrows by the authors of both maps (probably a coincidence, but perhaps not if Prof. Vidale reads this blog). Keep in mind also that last year Prof. Vidale sent samples from the Swat Valley cemeteries to the ancient DNA lab at Harvard for testing and analysis (see here). So if these samples yielded endogenous DNA (wink, wink), then he probably knew the results when he drew up his map. Several South Central Asian populations have a reputation for producing individuals who look surprisingly European, even the lighter shade sort of European from Eastern and Northern Europe. This is especially true of the Pamiri Tajiks, and that's unlikely to be a coincidence, because these people probably do harbor a lot of ancient Eastern European ancestry. 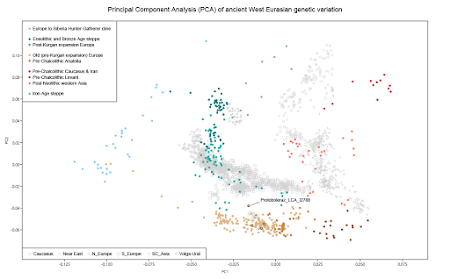 My own estimates, using various ancestry modeling methods, suggest that Pamiri Tajiks derive ~50% of their genome-wide genetic ancestry from populations closely related to, and probably derived from, Eneolithic/Early Bronze Age pastoralists from the Pontic-Caspian steppe of Eastern Europe, such as the Sredny Stog and Yamnaya peoples. 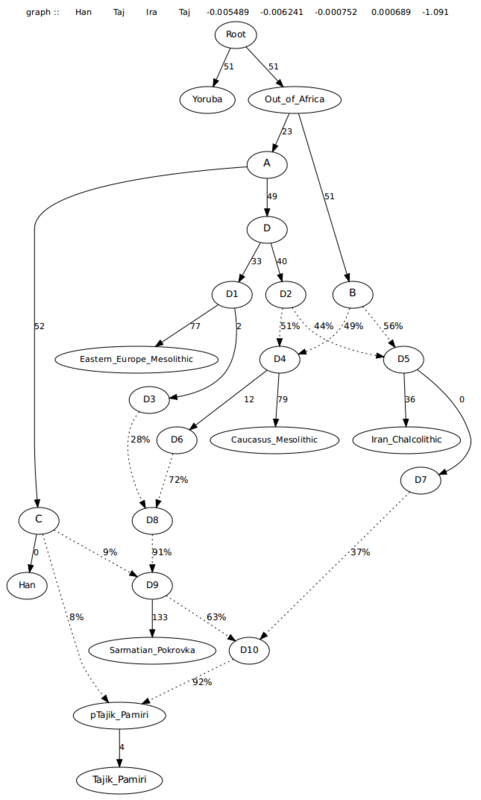 Below is a simple Admixture graph using the mostly Yamnaya-derived Iron Age Sarmatians from Pokrovka, Russia, in far Eastern Europe, to illustrate the point. Note that Sarmatians were East Iranic-speakers, which is what Pamiri Tajiks are. The relevant graph file is available here. But, some of you might retort, this is all just statistical smoke and mirrors, and what it really shows is that these so called Europeans came from Central Asia or even India. Not so, because my models can't be twisted any which way, and they have strong support from uniparental marker data. 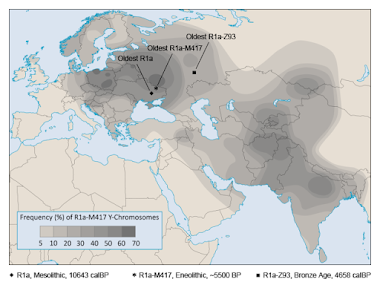 Many South Central Asian groups, and especially Indo-European-speakers, like the Tajiks, show moderate to high frequencies of two Y-chromosome haplogroups typical of Bronze Age Eastern Europeans: R1a-M417 and R1b-M269. This is old news to the regular visitors here and its implications are obvious, so if you still think that these haplogroups expanded from South Central Asia to Eastern Europe, rather than the other way around, then please update yourself (for some pointers, see here and here). And now, courtesy of Peng et al. 2017, we also have a much better understanding of ancient European influence on the maternal gene pool of Pamiri groups (see here). 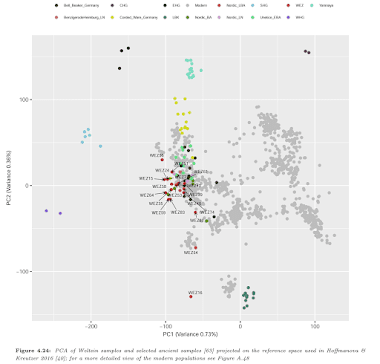 The paper doesn't specifically cover the topic of European admixture in South Central Asia, but it nevertheless demonstrates it unequivocally. 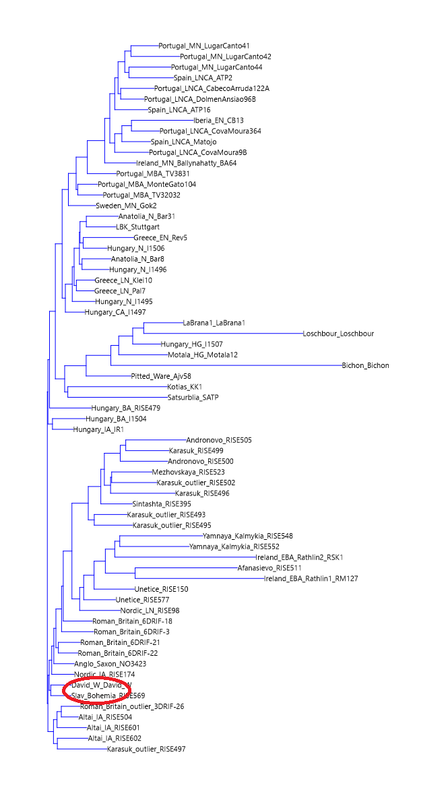 Below are a couple of phylogenetic trees from the paper featuring a wide range of mitochondrial DNA (mtDNA) sequences shared between Europeans and Central and South Asians; quite a few of these lineages are rooted in Eastern Europe, as shown by both modern-day and ancient DNA, so they strongly imply gene flow, and indeed considerable maternal gene flow, from Eastern Europe deep into Asia. Worthy of note are the lineages belonging to such relatively young (likely post-Neolithic) haplogroups as U5a1a1, U5a1d2b, U5a2a1, and U5b2a1, all of which have already been found in ancient remains from the Pontic-Caspian steppe. I'm no longer wondering whether there were massive population movements from Eastern Europe to South Central Asia during the metal ages. It's a given that they happened, and I'm now looking forward to learning about the details from ancient DNA. For instance, what was the ratio of men to women amongst these migrants? And how fair were they exactly? Two former Harvard scientists Pontus Skoglund and Iain Mathieson are working on a new review paper on the wide range of scientific breakthroughs provided by ancient genomics over the past decade. The preprint is available at Dropbox here. There's also a thread about the preprint at Mathieson's Twitter account here. Anatomically modern humans were widely distributed in Europe by at least 42,000-45,000 BP (3; 41). The oldest genomic data from a modern human in Europe is the Oase 1 individual from present-day Romania dated to 37,600-41,600 BP. This individual, which had a direct Neanderthal ancestor in the past four to six generations, did not contribute detectable ancestry to later Upper Paleolithic populations (24). During the Upper Palaeolithic, a major transformation ~30,000-35,000 years ago was likely associated with the replacement of the Aurignacian with the Gravettian culture in western Europe(28). As the Last Glacial Maximum (LGM) came to an end and the ice sheets receded, Europe was repopulated, possibly from southern European and central Eurasian refugia (28). Another transformation may have taken place during an interstadial warm period ~14.5 kya, replacing the original recolonizers with a population that would come to form the Mesolithic populations of Europe (28; 93). These Mesolithic populations were outside the genetic diversity of present-day Europe (114; 131) and themselves display a clinal structure, with an east-to-west cline (32; 37; 38; 47; 57; 62; 72; 78; 112; 130). The origin of this cline is not clear, although it plausibly reflects two or more major sources of ancestry in the post-LGM or post-14.5kya expansions. 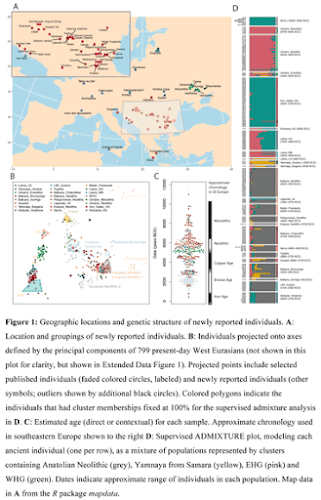 Starting from the southwest around 8,500 BP, the Mesolithic ancestry of Europe was largely replaced (29; 38; 42; 130; 131) as a new type of ancestry related to that found in Neolithic northwest Anatolia (73; 87) and, ultimately, to early farming populations of the Levant and Northern Iran (11; 56) expanded throughout Europe. This ancestry rapidly reached the extreme edges of Europe, with direct evidence of its presence in Iberia at 7300 BP (86), in Ireland at 5100 BP (14) and in Scandinavia at 4900 BP (131). 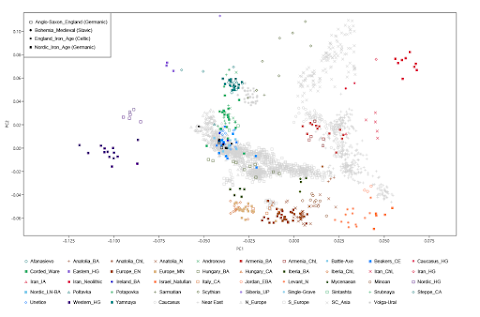 This “Anatolian Neolithic” ancestry was highly diverged relative to the “hunter-gatherer” ancestry of the populations that previously inhabited Europe (F ST ~ 0.1, similar to the divergence between present-day European and East Asian populations) (73; 132). Across Europe, its appearance was closely linked in time and space to the adoption of an agricultural lifestyle, and it now seems established that this change in lifestyle was driven, at least in part, by the migration. However, the Anatolian Neolithic migrants did not replace the hunter-gatherer populations. Over the next 4000 years, the two populations merged, and by 4500 BP, almost all European populations were admixed between these two ancestries, typically with 10-25% hunter-gatherer ancestry (29; 38; 42; 50; 62; 71; 73; 130; 131). Across Europe, this “resurgence” of hunter-gatherer ancestry (10) was independent–driven by local hunter-gatherer populations who lived in close proximity to farming groups (7; 62; 72; 130). The next substantial change is closely related to ancestry that by around 5000 BP extended over a region of more than 2000 miles of the Eurasian steppe, including in individuals associated with the Yamnaya Cultural Complex in far-eastern Europe (1; 38) and with the Afanasievo culture in the central Asian Altai mountains (1). This “steppe” ancestry is itself a mixture between ancestry that is related to Mesolithic hunter-gatherers of eastern Europe and ancestry that is related to both present-day populations (38) and Mesolithic hunter-gatherers (46) from the Caucasus mountains, and also to the populations of Neolithic (11), and Copper Age (56) Iran. 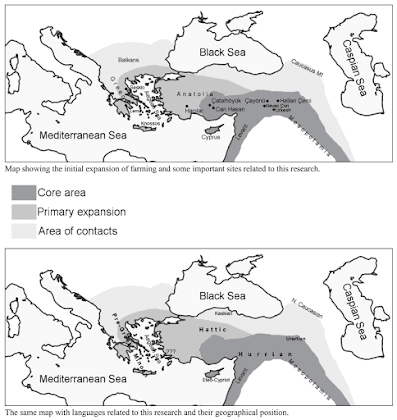 Steppe ancestry appeared in southeastern Europe by 6000 BP (72), northeastern Europe around 5000 BP (47) and central Europe at the time of the Corded Ware Complex around 4600 BP (1; 38). These dates are reasonably tight constraints, because in each case there is no evidence of steppe ancestry in individuals immediately preceding these dates (47; 72). 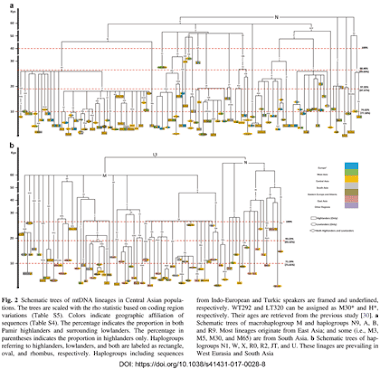 Gene flow on the steppe was extensive and bidirectional, as shown by the eastward flow of Anatolian Neolithic ancestry–reaching well into central Eurasia by the time of the Andronovo culture ~3500 BP (1)–and the westward flow of East Asian ancestry–found in individuals associated with the Iron Age Scythian culture close to the Black Sea ~2500 BP (143). 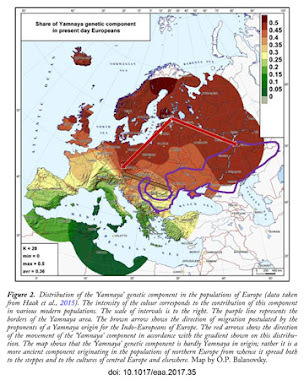 Copper and Bronze Age population movements (14; 78 Martiniano, 2017 #8761; 85; 112), as well as later movements in the Iron Age and Historical period (70; 119) further distributed steppe ancestry around Europe. Present-day western European populations can be modeled as mixtures of these three ancestry components (Mesolithic hunter-gatherer, Anatolian Neolithic and Steppe) (38; 57). In eastern Europe, further shifts in ancestry are the result of additional or distinct gene flow from Anatolia throughout the Neolithic and Bronze Age in the Aegean (42; 51; 55; 72; 87), and gene flow from Siberian-related populations in Finland and the Baltic region (38). And I really like this part; sounds ominous for the Out-of-India (OIT) crowd, doesn't it? Hopefully we won't have to wait too long for the relevant paper from Harvard, which, I can assure you, is coming sooner or later. There are no published ancient DNA studies from South- or Southeast Asia. However, data from neighboring regions provides clues to the population history of this region. In particular, present-day South Asian populations share ancestry with Neolithic Iranian (11) and Steppe (56) populations. 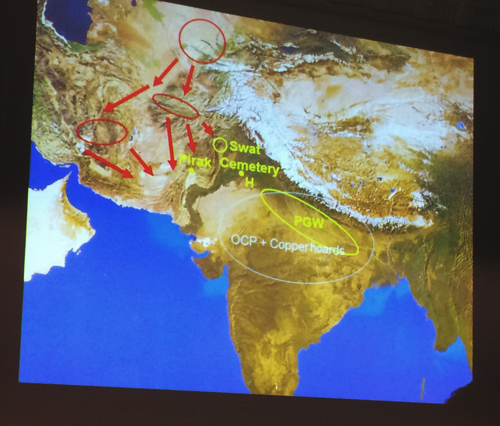 This strongly suggests Neolithic or Bronze Age contact between South Asia and west/central Eurasia, although only direct ancient DNA evidence from the region will resolve the timing and structure of this contact. 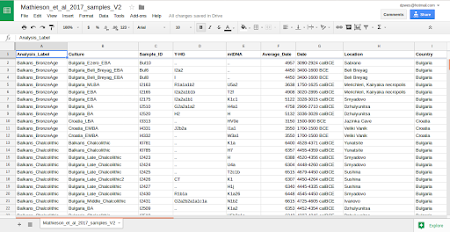 Considering the increasingly large numbers of paleogenomic samples being released online nowadays, it's no longer practical for me to try to highlight most archaeological cultures and even genetic clusters in my Principal Component Analyses (PCA) of the ancient world. 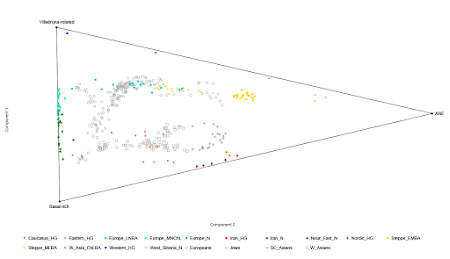 Thus, from now on, I'll be focusing attention in such PCA on the main population shifts that have led to the formation of the modern-day West Eurasian gene pool and genetic substructures, like on the PCA plot below, which includes the new Lipson et al. 2017 data (available at the Reich Lab here). 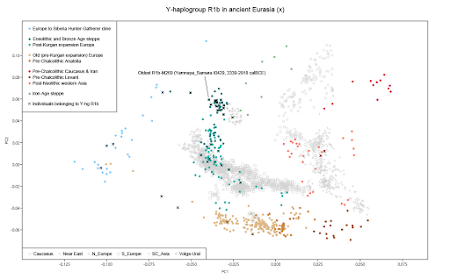 An interesting outcome of the denser sampling from space and time in West Eurasia is that Y-haplogroup R1b, once so elusive in the ancient DNA record, is now popping up all over the place. The new Lipson et al. dataset, for instance, includes two R1b "Old Europeans" from Blatterhole in Germany dated to the Middle Neolithic. 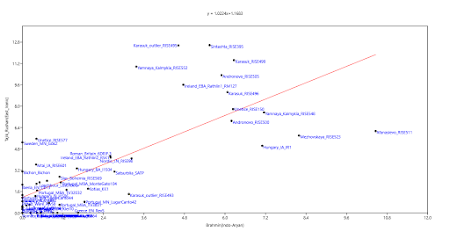 Below is the same PCA as above except with all of the ancients belonging to R1b marked with an X. The two Blatterhole samples are sitting in the largely empty space between the European/Siberian Hunter-Gatherer cline and most of the "Old Europe" cluster. The relevant PCA datasheet is available here. So it may seem that we're back to square one in the long running effort to pinpoint the origin of Y-haplogroup R1b-L51, which encompasses almost 100% of modern-day Western European R1b lineages, and thus probably ranks as Europe's most common Y-haplogroup. But at this stage I'd say no, because R1b-L51 is a subclade of R1b-M269, of which the oldest sample comes from the Bronze Age steppe. In fact, as can be seen in the above PCA, this sample is sitting in exactly the right spot to be one of those pastoralists who overran "Old Europe", or at least a very close relative thereof. Or am I wrong? Feel free to let me know in the comments. I didn't bother creating a similar plot of ancient samples belonging to Y-haplogroup R1a, because, unlike R1b, this marker is still non-existent in samples from outside of Eastern Europe and Siberia dating to before the late Neolithic. And I doubt that this is simply due to a lack of the right ancient material. Moreover, the recent discovery of Y-haplogroup R1a-M417, which encompasses almost 100% of all modern-day R1a lineages on the planet, in a North Pontic steppe sample belonging to the Eneolithic Sredny Stog culture means that it's game over for the naysayers as far as the steppe origin of most modern-day R1a lineages is concerned (see here and here). In other words, if you're still hoping to see R1a, and especially R1a-M417, pop up in non-steppe derived ancient individuals in, say, such far away places as South Asia, then you'll probably be waiting forever. Update 15/11/2017: After a couple of days of messing around with the Lipson et al. 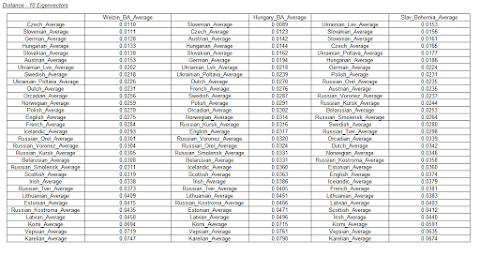 dataset, I'm certain that Late Copper Age sample Protoboleraz_LCA I2788 shows significant steppe-related admixture. This is the only sample from Lipson et al. 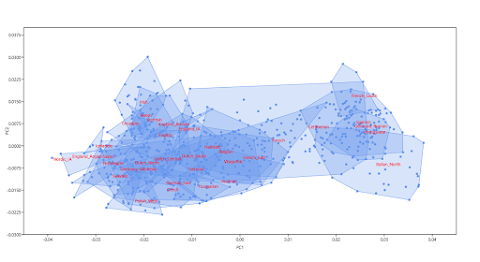 with such an obvious signal of steppe-related input that had enough data to be analyzed individually by me with PCA and D-stats. For the time being, amongst the best proxies for this signal appear to be Yamnaya_Samara and Samara_Eneolithic. But it's likely that the real source of the admixture is yet to enter the ancient DNA record, or at least my dataset. When it does, it'll probably be an Eneolithic pastoralist population from the North Pontic steppe. Yamnaya_Samara also gives the best statistical fit as the single source population in qpAdm (see here). It's an important result, because it suggests that steppe peoples very similar to Yamnaya were already expanding on and out of the steppe as far back as ~3500 BCE, and perhaps a few hundred years earlier. Descendants of Greeks in the medieval Himalayas? Below is an abstract from the upcoming Human Evolution 2017 conference (Cambridge, UK, November 20-22). It'll be interesting to see when the paper comes out how Harney, Patterson et al. uncovered the Greek affinities of some of these individuals; uniparental markers, rare alleles? The accompanying pic is from Wikipedia. The high-altitude lake of Roopkund, situated over 5000 meters above sea level in the Himalayas, remains frozen for almost 11 months out of the year. When it melts, it reveals the skeletons of several hundred ancient individuals, thought to have died during a massive hail storm during the 8th century, A.D. There has been a great deal of speculation about the possible identity of these individuals, but their origins remain enigmatic. 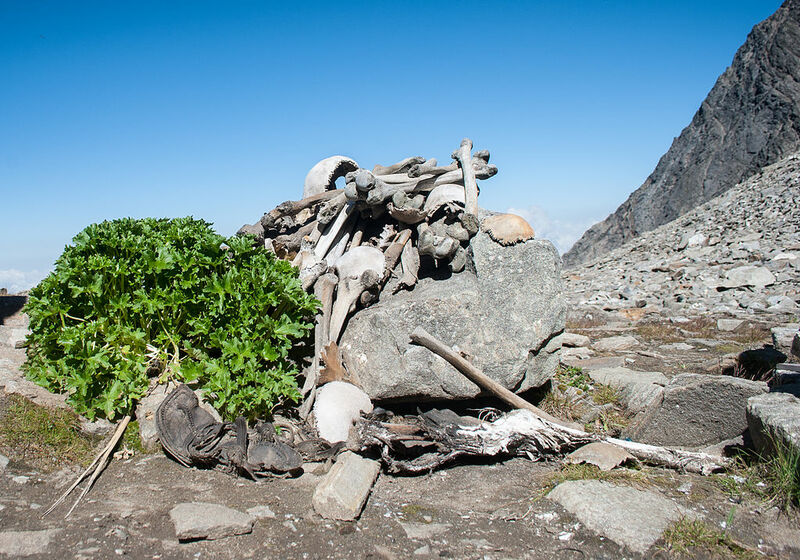 We present genome-wide ancient DNA from 17 individuals from the site of Roopkund. We report that these individuals cluster genetically into two distinct groups-consistent with observed morphological variation. Using population genetic analyses, we determine that one group appears to be composed of individuals with broadly South Asian ancestry, characterized by diffuse clustering along the Indian Cline. 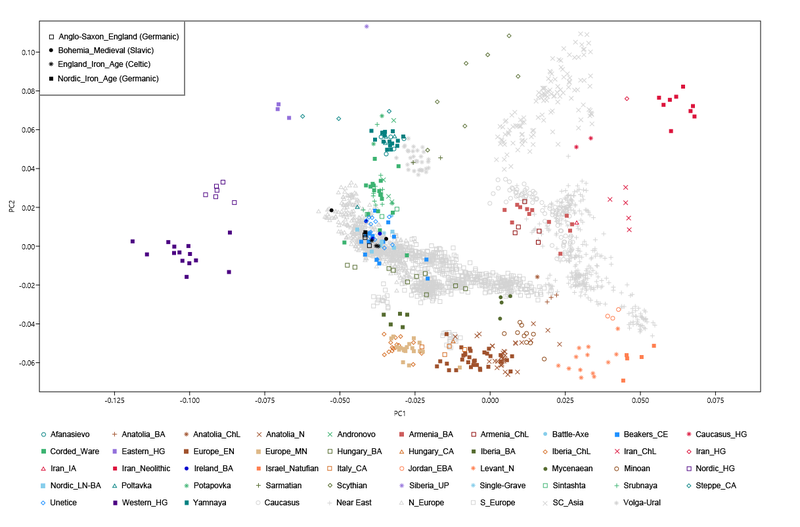 The second group appears to be of West Eurasian related ancestry, showing affinities with both Greek and Levantine populations. Following a rigorous testing phase, the awesome Global 25 analysis is now available at the store for $12 USD (see here). What's so awesome about this test, you might ask? See here and here. Please send your request, autosomal genotype data (from AncestryDNA, FTDNA, MyHeritage or 23andMe) and money (via PayPal) to eurogenesblog at gmail dot com. However, note that this test is free for anyone who already has Global 10 coordinates (see here). That's right, if you already have Global 10 coordinates, all you have to do is to send me your data and say what it's for. Simple as that. My Celtic vs Germanic Principal Component Analysis (PCA) is now available via the store for $6 USD (see here). Please note that this test is only really useful for people of Central, Northern and/or Western European origin, and indeed geared for those of overwhelmingly Northwestern European ancestry. The popular Basal-rich K7 admixture test is now available via the store for $6 USD. It's suitable for everyone, except people with significant (>10%) Sub-Saharan ancestry. For more information about this test and some ideas about what to do with the output see here and here. It's an unfortunate reality that most commercial genetic ancestry tests out there are rather lame. They're not wrong per se, but that's probably the best that can be said about them. And let's be honest, that's no longer enough considering how far this area of science has come in recent years. To try and remedy this problem, I'll be offering a wide range of highly accurate and unique, but low cost, ancestry tests here, in my makeshift online store, based on analyses on this blog. These tests will focus on either recent or ancient ancestry, or both, using the latest reference samples from scientific literature whenever possible. To make a purchase, send your request, autosomal genotype data (from AncestryDNA, FTDNA, MyHeritage or 23andMe) and money (via PayPal) to eurogenesblog at gmail dot com. Let's start things rolling with my genetic and linguistic landscape of Europe north of the Alps, Balkans and Pyrenees (see here). For a mere $6 USD I will pinpoint your location on the plot below amongst a variety of modern-day and ancient individuals. You'll also receive the principal component coordinates, which you can use to model your ancestry proportions (for instance, like here). Please keep in mind, however, that to ensure sensible results in this particular analysis, practically all of your ancestry has to derive from Central, Eastern and/or Northern Europe. Most of my other tests won't be so restrictive. The relevant datasheet is available here. I'll be updating this plot regularly with many more ancient samples as they become available, but your coordinates will remain relevant as I do so. 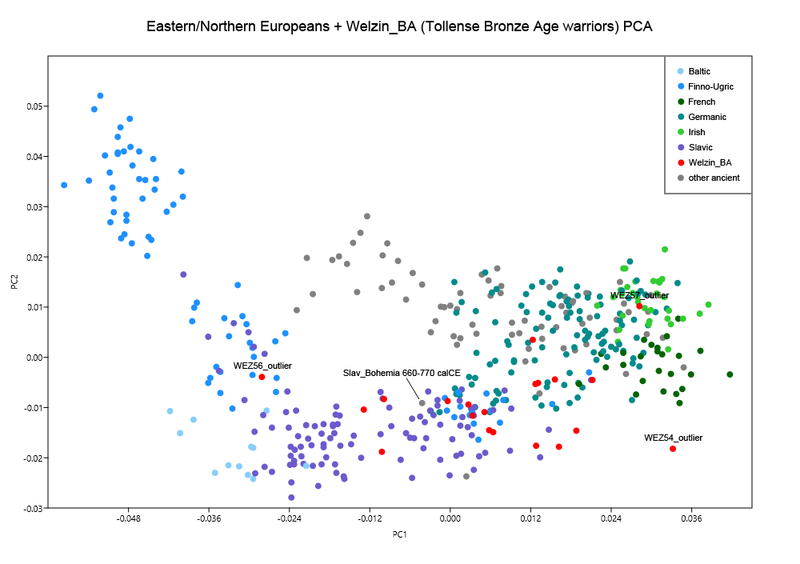 I feel that I need to do a double take, and demonstrate more obviously why my new PCA, the one that I introduced in the recent Tollense Valley warrior blog post (see here), should prove very useful for analyzing both genetic and ethnolinguistic links in Northern Europe between modern-day populations and ancient samples, particularly those from late prehistory to early history, which is when the main ethnolinguistic groups that today dominate Northern Europe formed. Judging by some of the reactions in the comments, not everyone was convinced, so let's try this again. 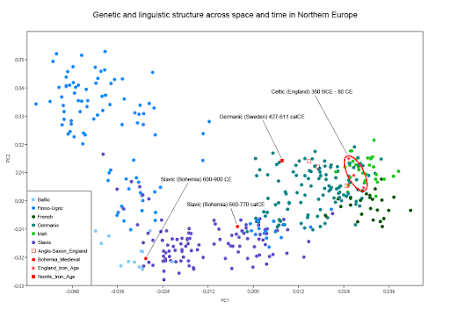 Below is a new version of the said PCA that focuses on several ancient individuals who, based on their archaeological contexts, should show strong genetic affinities to modern-day speakers of Celtic, Germanic and Slavic languages in Northern Europe. These are three Iron Age samples from what is now England, one Iron Age sample from what is now Sweden, and two Medieval samples from what is now Bohemia, Czech Republic, respectively. The relevant datasheet is available here. And clearly these ancients do show the expected genetic affinities considering where they cluster relative to modern-day Northern Europeans in the two most significant dimensions of genetic variation. Moreover, despite the fact that the Anglo-Saxon and English Iron Age samples were all excavated from sites in eastern England, the Anglo-Saxons cluster between the English Iron Age individuals and the singleton Scandinavian Iron Age sample. This of course makes perfect sense, considering that the Anglo-Saxons were Germanic speakers with recent ancestry from very near to Scandinavia. So everything seems in good order, and for now it's very difficult for me to consider that those Tollense Valley warriors who cluster alongside modern-day Slavic speakers on my PCA are not ethnolinguistically closer to them than to Celtic and Germanic speakers. 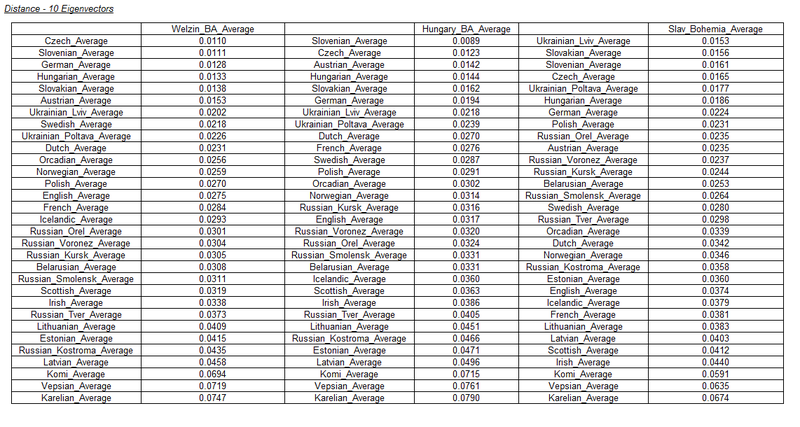 On the other hand, my standard PCA of West Eurasian genetic variation does a comparatively lousy job at matching ethnolinguistic origins with genetic structure, at least in Northern Europe. Note below, for instance, that the same Celtic and Germanic samples from England and Scandinavia form a tight cluster between the two Slavs from Bohemia. 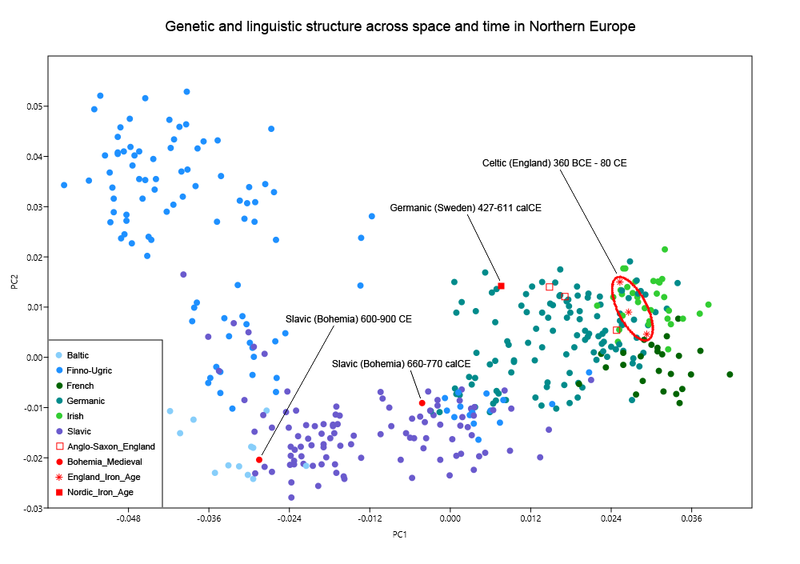 Hence, based on this PCA it would be very difficult, perhaps impossible, to correctly predict the ethnolinguistic ties of these ancients just by looking where they cluster relative to modern-day Germanics, Slavs and so on. Right click and open in a new tab to enlarge to the max. 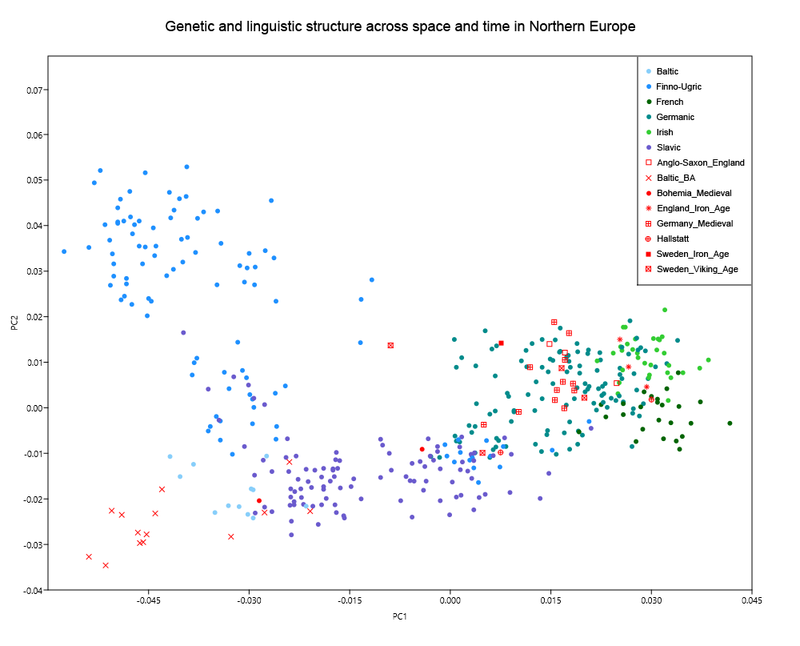 But this is not surprising, because this PCA is based on a wider, more diverse range of populations, and so rather than being dominated by relatively recent, ethnolinguistic-specific genetic drift within Northern Europe, it's much more reflective of deeper, more basic genetic relationships across West Eurasia. The series of maps below is from a new paper by Liebert et al. at Human Genetics. Almost certainly, any population with a sizable level of the 13910*T allele has relatively recent (post-Mesolithic) ancestry from Europe. In that context, note the presence of 13910*T in South Asia and North Central Africa. Populations in these regions also show high frequencies of two Y-chromosome haplogroups that are present in samples from Mesolithic Eastern Europe: R1a and R1b-V88, respectively. It's hard to imagine that this is a coincidence. Summary: The origins and genetic affinity of the aboriginal inhabitants of the Canary Islands, commonly known as Guanches, are poorly understood. Though radiocarbon dates on archaeological remains such as charcoal, seeds, and domestic animal bones suggest that people have inhabited the islands since the 5th century BCE [1, 2, 3], it remains unclear how many times, and by whom, the islands were first settled [4, 5]. 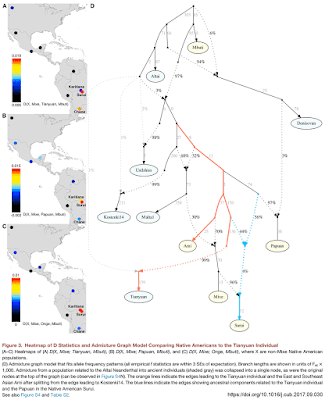 Previously published ancient DNA analyses of uniparental genetic markers have shown that the Guanches carried common North African Y chromosome markers (E-M81, E-M78, and J-M267) and mitochondrial lineages such as U6b, in addition to common Eurasian haplogroups [6, 7, 8]. These results are in agreement with some linguistic, archaeological, and anthropological data indicating an origin from a North African Berber-like population [1, 4, 9]. However, to date there are no published Guanche autosomal genomes to help elucidate and directly test this hypothesis. 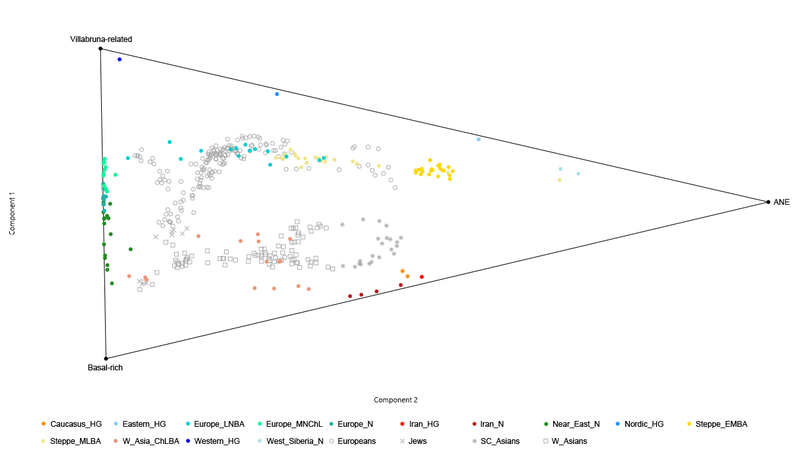 To resolve this, we generated the first genome-wide sequence data and mitochondrial genomes from eleven archaeological Guanche individuals originating from Gran Canaria and Tenerife. 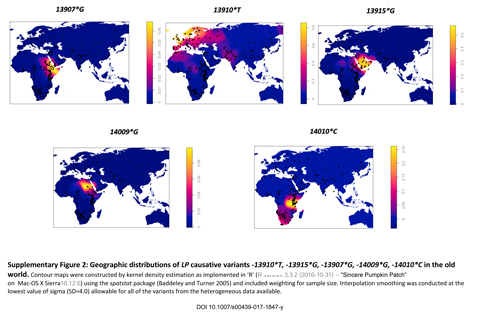 Five of the individuals (directly radiocarbon dated to a time transect spanning the 7th–11th centuries CE) yielded sufficient autosomal genome coverage (0.21× to 3.93×) for population genomic analysis. Our results show that the Guanches were genetically similar over time and that they display the greatest genetic affinity to extant Northwest Africans, strongly supporting the hypothesis of a Berber-like origin. We also estimate that the Guanches have contributed 16%–31% autosomal ancestry to modern Canary Islanders, here represented by two individuals from Gran Canaria. Addressing challenges of ancient DNA sequence data obtained with next generation methods. The 21 samples available to this study stem from skeletal remains found in the Tollense valley in north eastern Germany and date to the bronze age (ca. 3200 BP), except for sample WEZ16, which dates to the neolithic (ca. 5000 BP) and was found in a burial context. Although several samples from the Welzin site have been dated using the C 14 method, from the samples used for this study only the neolithic WEZ16 (2960BC ±66) and the Bronze Age sample WEZ15 (1007BC ±102) were radiocarbon dated. All individuals except WEZ16 were found in a non burial context, widely dispersed and dis-articulated  along the river bank of the Tollense river. 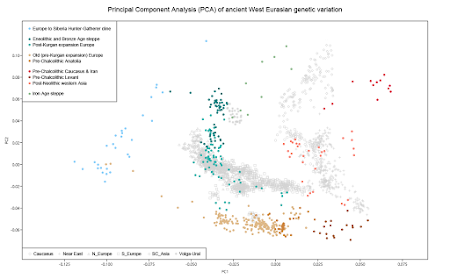 The PCA in Figure 4.24 shows modern Eurasian individuals in grey and ancient individuals in colour according to their assigned population (for details on the modern populations see Figure A.48). 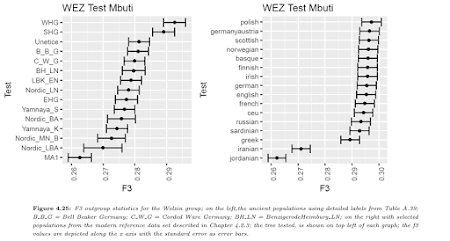 The majority of Welzin individuals fall within the variation of modern populations from the northern central part of Europe (compare Figure A.48), with hunter gatherers, the Yamnaya and the LBK populations appearing on the outer range of PC1 and PC2. 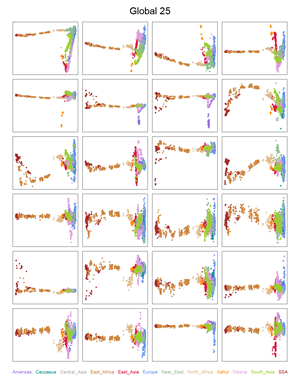 Outliers from the Welzin cluster are: WEZ16, which falls closer to the Sardinians and neolithic LBK along PC2, WEZ54, which clusters with the Basques and also fall closer to LBK individuals along PC2, WEZ57, which falls in between the former individual and the Welzin cluster, and WEZ56, which separates from the main cluster of Welzin individuals along PC2 in the opposite direction as the former three, towards the Corded Ware or Yamnaya. The ancient population that share the most drift with the Welzin group are WHG and the SHG population followed by the Unetice, the Bell Beaker and the Corded Wear. Starting with the Unetice the following f3 values fall in the range of the standard error of each other. The average difference between two consecutive f3 values is 0.0021 ± 0.0024 and the average standard error in each f3 value is 0.0037 ± 0.0007. The most similar modern populations are the Polish, Austrians and the Scottish. Any interpretation regarding possible parties that might have been involved in the conflict in the Tollense valley ∼ 3200 ago can only be speculative with regards to the here shown data. With the resolution given here, an educated guess for different involved parties could be, that both parties were relatively local and more closely related than any ancient DNA study was able to separate so far. Maybe similar to people from Hessen versus people from Rhineland-Palatinate in modern Germany. The most commonly found haplogroups [among Lithuanians] are R1a and N, hence it can be argued that Lithuanians originate from Pakistan/Northwest India and East China/Taiwan. The mad scientists are at it again. The quote below is from an American Society of Human Genetics (ASHG) talk abstract. For the whole thing see here. Now, as I've pointed out on this blog before, Finns do not have Buryat or Mongolian ancestry, or anything even closely related dating to the Middle Ages. What they do have is some sort of Siberian admixture, which has been poorly characterized to date, but is probably associated with archaeologically attested population movements across northern Eurasia during the metal ages. We identified significant gene flow from the Buryats to the Finnish which was predicted to be occurred in 1,228 (±87) year. Moreover, 13.38% of Buryat admixture was predicted in the Finnish genome. This sort of nonsense should never be let through peer review anywhere. It makes the ASHG and indeed population genetics look like a total joke. In fact, imagine if such sloppy inferences from population genetics are allowed to influence medical genetics work. Someone might eventually get hurt. 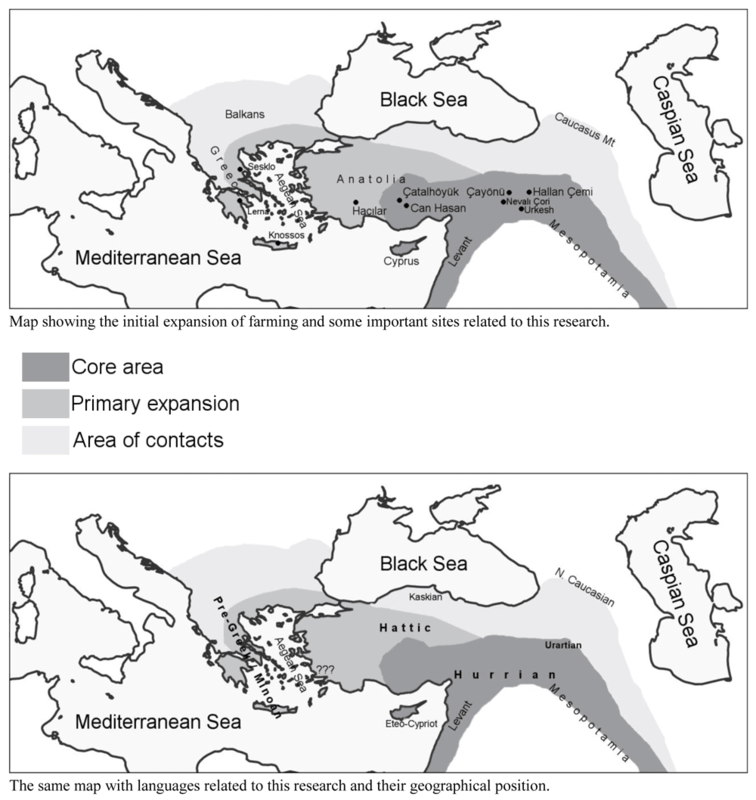 By at least 45,000 years before present, anatomically modern humans had spread across Eurasia [1, 2, 3], but it is not well known how diverse these early populations were and whether they contributed substantially to later people or represent early modern human expansions into Eurasia that left no surviving descendants today. 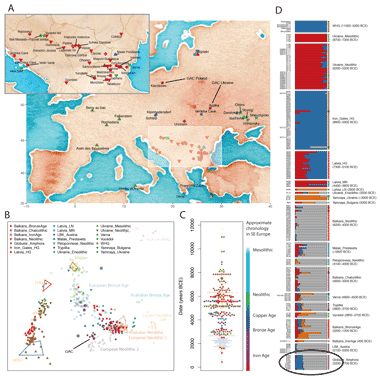 Analyses of genome-wide data from several ancient individuals from Western Eurasia and Siberia have shown that some of these individuals have relationships to present-day Europeans [4, 5] while others did not contribute to present-day Eurasian populations [3, 6]. 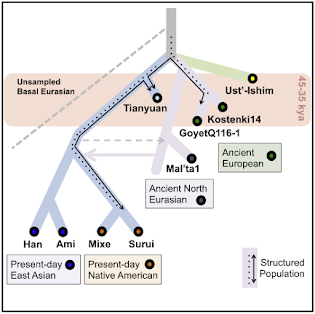 As contributions from Upper Paleolithic populations in Eastern Eurasia to present-day humans and their relationship to other early Eurasians is not clear, we generated genome-wide data from a 40,000-year-old individual from Tianyuan Cave, China, [1, 7] to study his relationship to ancient and present-day humans. We find that he is more related to present-day and ancient Asians than he is to Europeans, but he shares more alleles with a 35,000-year-old European individual than he shares with other ancient Europeans, indicating that the separation between early Europeans and early Asians was not a single population split. 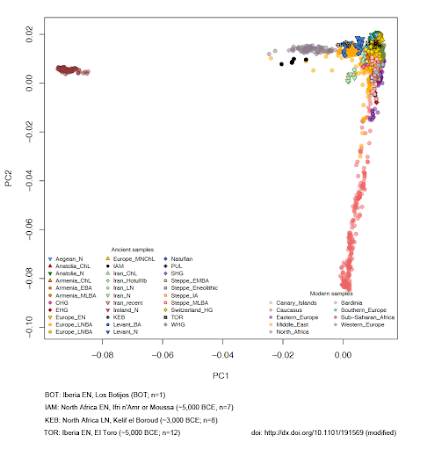 We also find that the Tianyuan individual shares more alleles with some Native American groups in South America than with Native Americans elsewhere, providing further support for population substructure in Asia  and suggesting that this persisted from 40,000 years ago until the colonization of the Americas. Our study of the Tianyuan individual highlights the complex migration and subdivision of early human populations in Eurasia. Over at Science at this LINK. Not surprisingly, these four Sunghir individuals are very similar to another Upper Paleolithic Eastern European, Kostenki14, in terms of both genome-wide genetic structure and uniparental markers (Y-haplogroup C1a2, mtDNA-haplogroups U2 and U8c). If you can't access the paper, the supplementary materials are freely available here, and there's a press release here. Abstract: Present-day hunter-gatherers (HGs) live in multilevel social groups essential to sustain a population structure characterized by limited levels of within-band relatedness and inbreeding. When these wider social networks evolved among HGs is unknown. 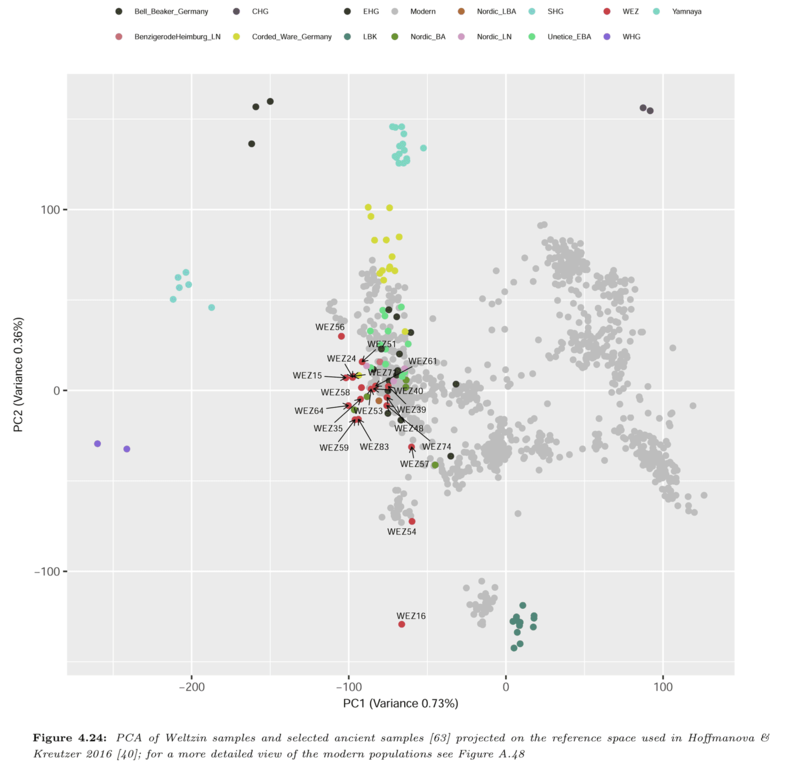 Here, we investigate whether the contemporary HG strategy was already present in the Upper Paleolithic (UP), using complete genome sequences from Sunghir, a site dated to ~34 thousand years BP (kya) containing multiple anatomically modern human (AMH) individuals. We demonstrate that individuals at Sunghir derive from a population of small effective size, with limited kinship and levels of inbreeding similar to HG populations. Our findings suggest that UP social organization was similar to that of living HGs, with limited relatedness within residential groups embedded in a larger mating network. M. Sikora et al., Ancient genomes show social and reproductive behavior of early Upper Paleolithic foragers, Science 10.1126/science.aao1807 (2017). I found a historical linguistics paper at Palaeolexicon.com that fits rather nicely with my homeland but not the homeland theory. It's freely available in a PDF here. Below is the abstract and conclusion. Fascinating stuff. In the late 80s and early 90s, Colin Renfrew presented his Anatolian hypothesis. According to him, the agrarian revolution begun in Anatolia, and from there, it spread out in Europe. He supposed that these farmers were carriers of the Proto-Indo European language, but his theory had weak support from Indo-European linguists. Some questions then arise: What language(s) was introduced in the Ægean islands and mainland Greece by these early farmers? Can we figure out the affiliations of the Minoan language? A different agrarian hypothesis will be shown in these pages, unrelated to the Indo-European and Semitic language families. It instead is featuring a new language family that encompasses the Ægean, Anatolia, Caucasus and the Near East. Both archaeology and genetics point to an agrarian migration to Greece, originating from central/western Anatolia and the fertile crescent. Several millennia later, we find Hattic spoken in central Anatolia, while Hurrian was spoken within a large part of the fertile crescent . Caucasus is nearby and is therefore a possible refuge of people akin to these early farming societies. 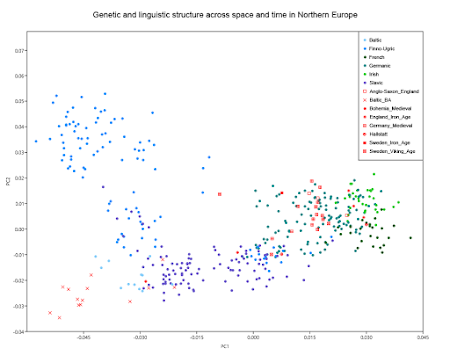 Linguistic data seem to incline towards the conclusions made by geneticists and archaeologists. The aforementioned migrational model can explain why Pre-Greek words have counterparts in Hattic, Hurro-Urartian and North Caucasian languages. After the Indo-European and Afro-Asiatic linguistic families’ reconstructions, a third big family might emerge from this research. The goal is to restore common roots between those languages. Thus, any finding must be within a framework of rules, the conventional Neogrammarian method that is universally accepted. Rules appear to be static and precise, any Pre-Greek word could have a counterpart with Hattic and/or Hurro-Urartian and/or North Caucasian languages; in all respect, ἀ-> *Ø- is seen in all occasions. There are more rules and lexical data, but they are not mentioned in this paper. This is a proposal for further investigation in Languages and Linguistics, from Bronze Age to present in the region between Asia and Europe. Giampaolo Tardivo, Philippos Kitselis, Prometheus or Amirani part 2. An updated study on the Pre-Greek substrate and its origins, Palaeolexicon, May 2017.